culating cloudy sky irradiances at all stations except in the arctic. 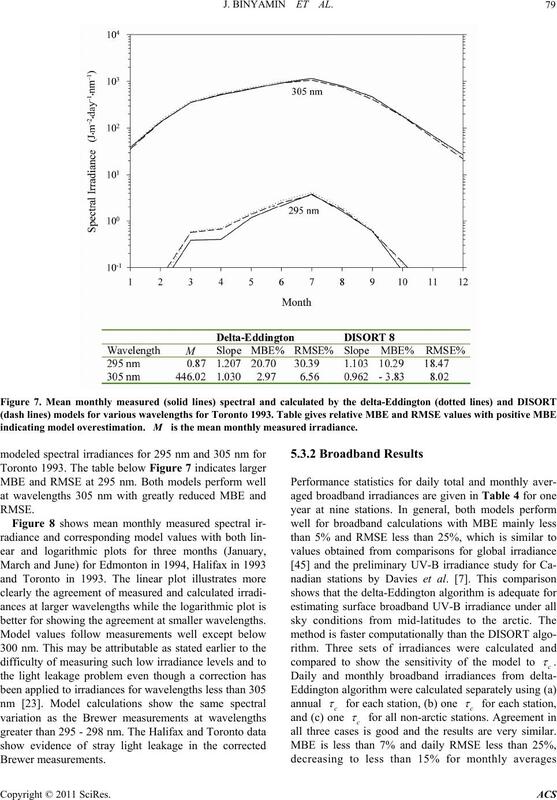 Comparisons are made both for daily totals and for monthly averaged spectral and broadband irradiances. root mean square error less than 25%, decreasing to below 15% for monthly averages. harmful biologically active ultraviolet (UV-B) irradiance. 70 J. BINYAMIN ET AL. for real atmospheres in the UV-B waveband. = 40) at 290 nm with zero surface albedo. Edmonton) using a small amount of data. The Brewer instruments have known uncertainties. Figure 1. Location of Canadian stations used in the study. 2% to 20% [e.g., 24,25]. ues should be increased by 2% and 8%, respectively. and Wang et al. .
where is the fraction of the sky that is cloud covered. solutions to the radiative transfer equation. asymmetry factors were calculated as layer averages. phere radiation transfer is considered only in the vertical. properties for the cloudless layer between 2 and 3 km. space shuttle mission launched on Nov. 13, 1994 (D.
each nanometer from 290 to 325 nm. visibility rural aerosol was used for all other stations. measured to total model atmospheric ozone depth. tude and subarctic stations) at all wavelengths . multiple scattering between cloud and snow . melting and snow contamination are ignored. 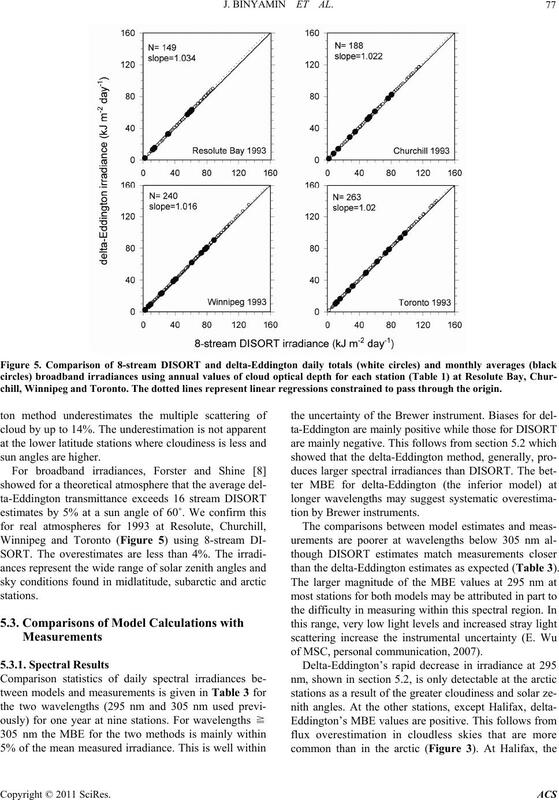 1993 with 302 DU total ozone column and a surface albedo of 0.05.
delta-Eddington values decrease rapidly below 302 nm. 300 nm in both cloudless and overcast cases. measured irradiance for the relevant period. hour, cloudiness variations between hours are missed. 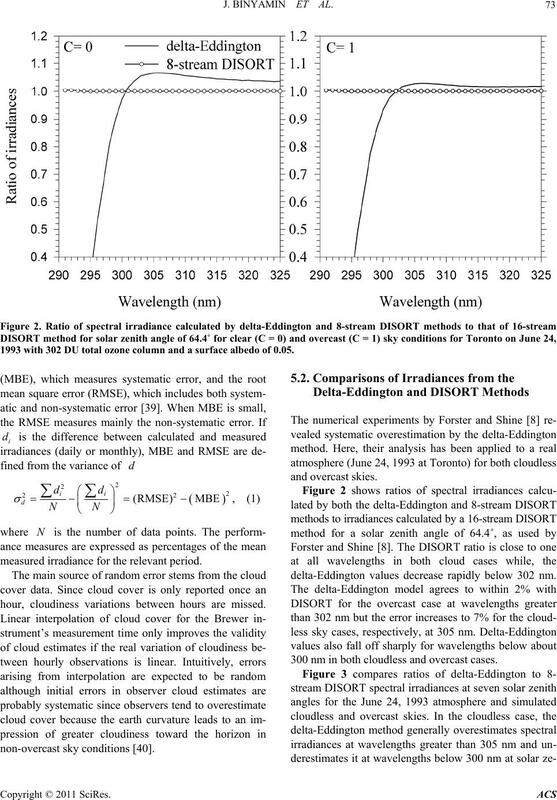 irradiances at most wavelengths in most cases. in the delta-Eddington approximation are less important. 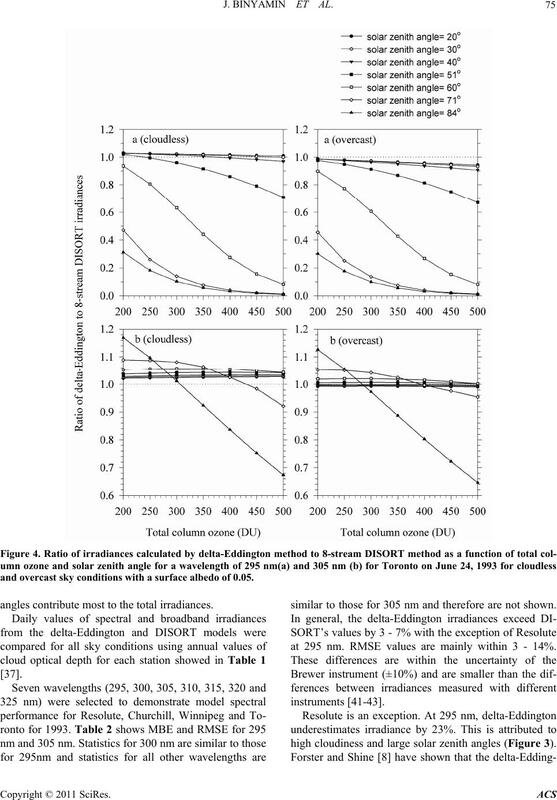 and overcast sky conditions with a surface albedo of 0.05.
angles contribute most to the total irradiances. similar to those for 305 nm and therefore are not shown. at 295 nm. RMSE values are mainly within 3 - 14%. high cloudiness and large solar zenith angles (Figure 3). Table 1. 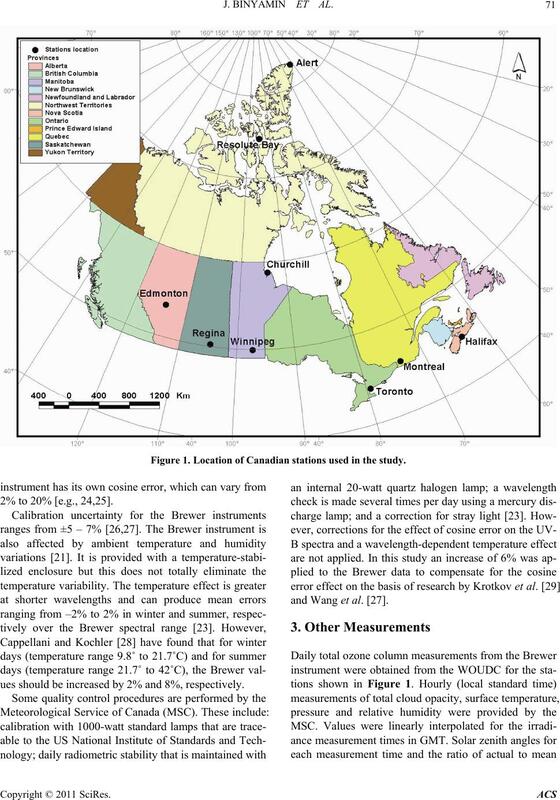 Characteristics of the inferred cloud optical depth for the nine Canadian datasets. N is the number of data points. chill, Winnipeg and Toronto. The dotted lines repres e n t linear regressions constrained to pass through the origin. 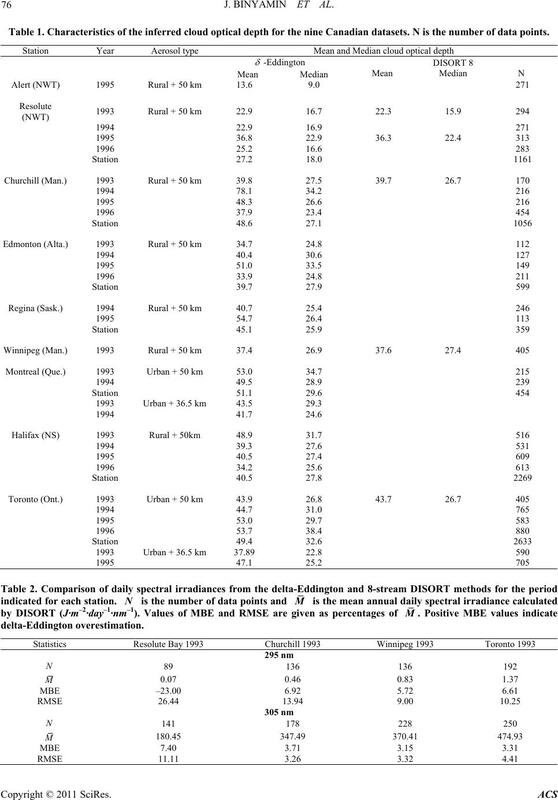 than the delta-Eddington estimates as expected (Table 3). of MSC, personal communication, 2007). tive MBE alues indicate model overest ima tion. 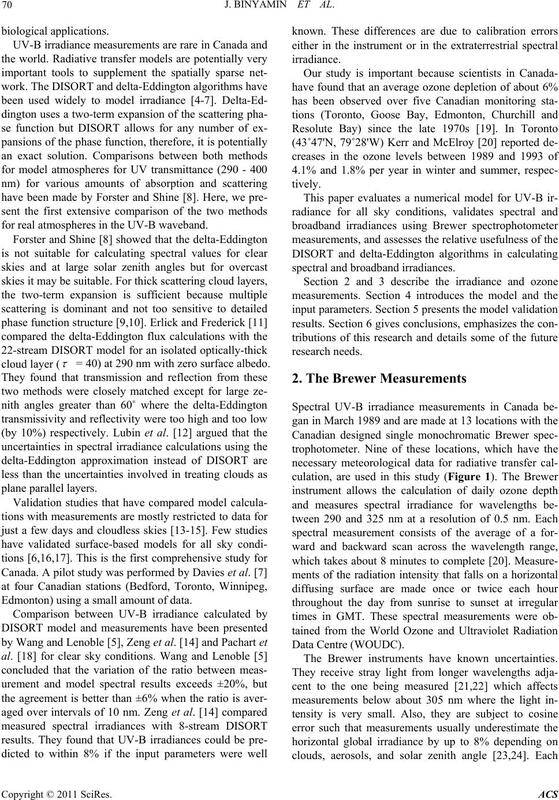 at 295, 305 nm for Toronto in 1993, Edmonton in 1994 and Resolute Bay in 1995.
error in the Brewer instrument. 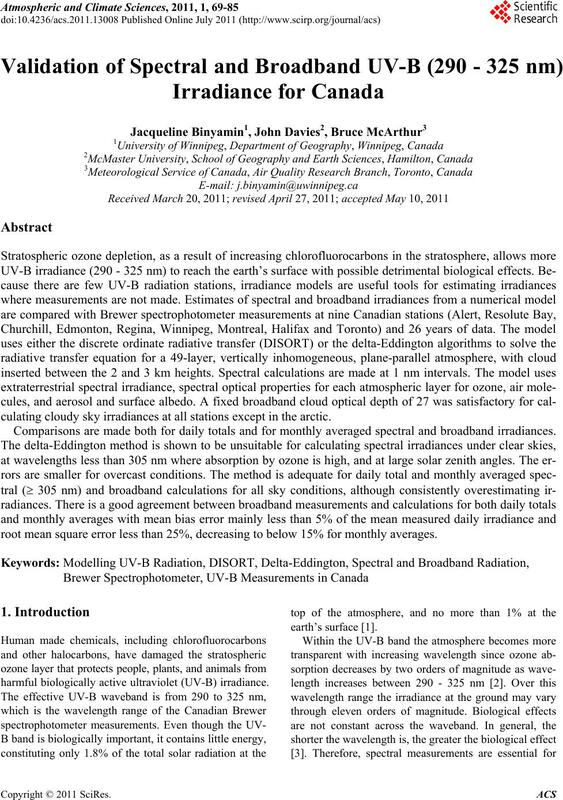 for broadband solar radiation estimates . indicating model overestimation. is the mean monthly measured irradiance. better for showing the agreement at smaller wavelengths. all three cases is good and the results are very similar. 1993 and Toronto in 1993. Table gives N which is the number of days used for each month. 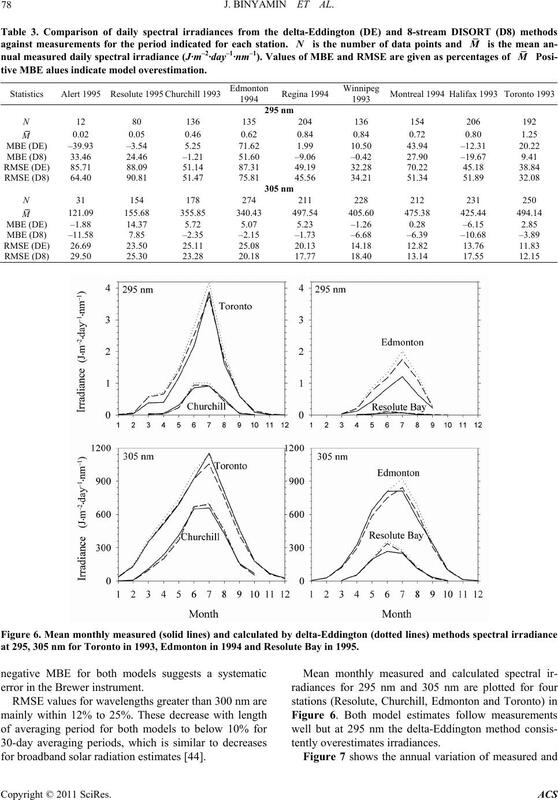 percentages (italic) of M. Positive MBE values indicate model overestimation. (dotted and black circles) for Halifax for years 1993-1996.
were combined to produce a pooled median value of 27.
less than 0.2% when this pooled median value is used. 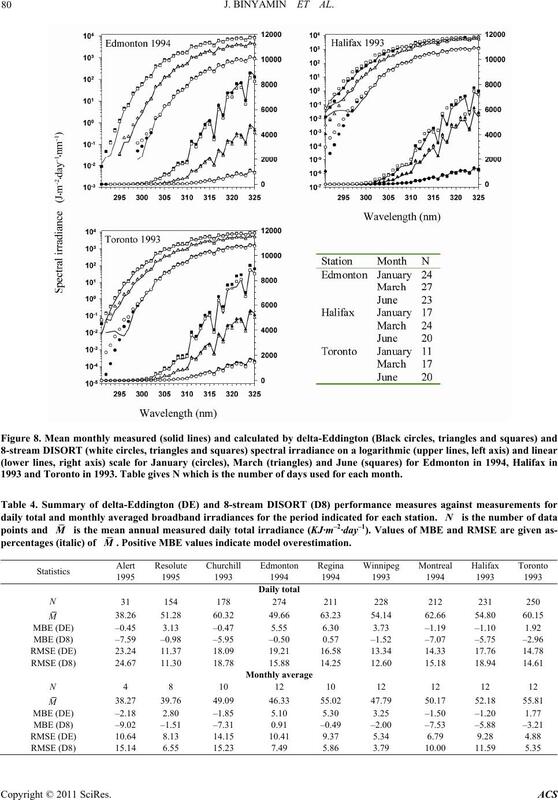 ance is shown in Figure 9 for Halifax (1993-1996). radiances for two aerosols loading. 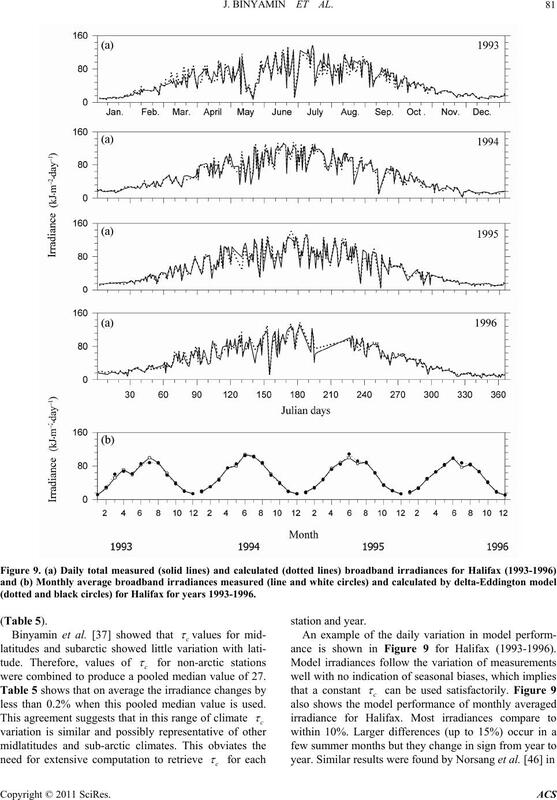 is the number of data points and NM is the mean measured irradiance (kJ·m–2·day–1). 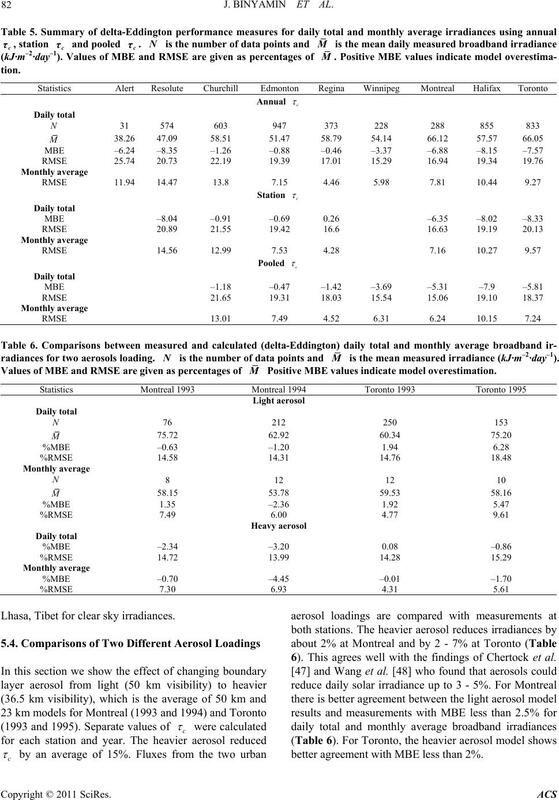 Values of MBE and RMSE are given as percentages of M Positive MBE values indicate model overestimation. Lhasa, Tibet for clear sky irradiances. 6). This agrees well with the findings of Chertock et al. better agreement with MBE less than 2%. formance varies with solar zenith angle and cloudiness. measurements at wavelengths < 305 nm. bly with those obtained for global radiation . for Montreal and a heavy aerosol model for Toronto. to determine potential biological exposure. This physically-based model can be applied anywhere. errors, as well as absolute radiometric calibration errors. chemistry and Phtobiology, Vol. 50, No. 4, 1989, pp. 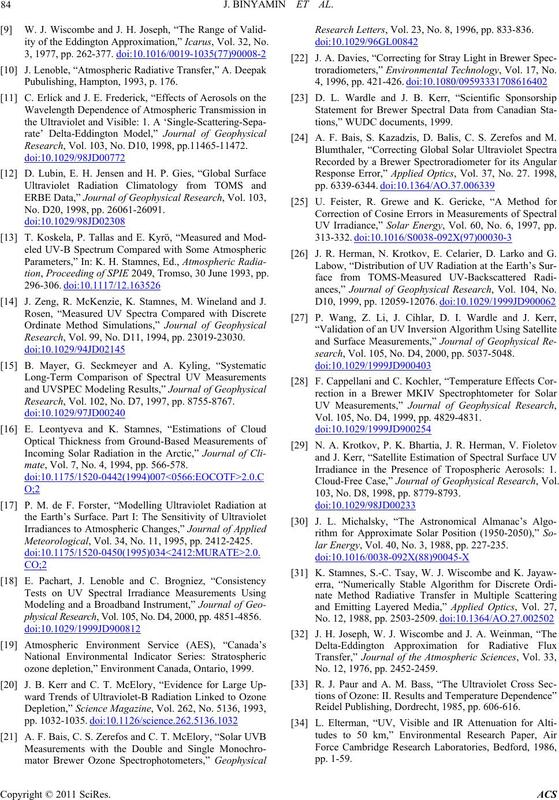 Range,” Journal of Geophysical Research, Vol. 91, No. Research, Vol. 97, 1992, pp. 7817-7827.
mospheres, Vol. 97, 1992, pp. 7829-7840. A Case Study,” Applied Optics, Vol. 33, No. 18, 1994, pp. plied Meteorology, Vol. 34, No. 11, 1995, pp. 2426-2439. J. Davies, P. Kuhn, G. Duhamel, J. Binyamin and K.
ography, Vol. 21, No. 4, 2000, pp. 327-344.
ciety, Vol. 121, No. 525, 1995, pp. 1113-1131. 84 J. BINYAMIN ET AL. ity of the Eddington Approximation,” Icarus, Vol. 32, No. Pubulishing, Hampton, 1993, p. 176. Research, Vol. 103, No. D10, 1998, pp.11465-11472. No. D20, 1998, pp. 26061-26091.
tion, Proceeding of SPIE 2049, Tromso, 30 June 1993, pp. J. Zeng, R. McKenzie, K. Stamnes, M. Wineland and J. Research, Vol. 99, No. D11, 1994, pp. 23019-23030. Research, Vol. 102, No. D7, 1997, pp. 8755-8767.
mate, Vol. 7, No. 4, 1994, pp. 566-578. Meteorological, Vol. 34, No. 11, 1995, pp. 2412-2425.
physical Res earch, Vol. 105, No. D4, 2000, pp. 4851-4856.
ozone depletion,” Environment Canada, Ontario, 1999. Research Letters, Vol. 23, No. 8, 1996, pp. 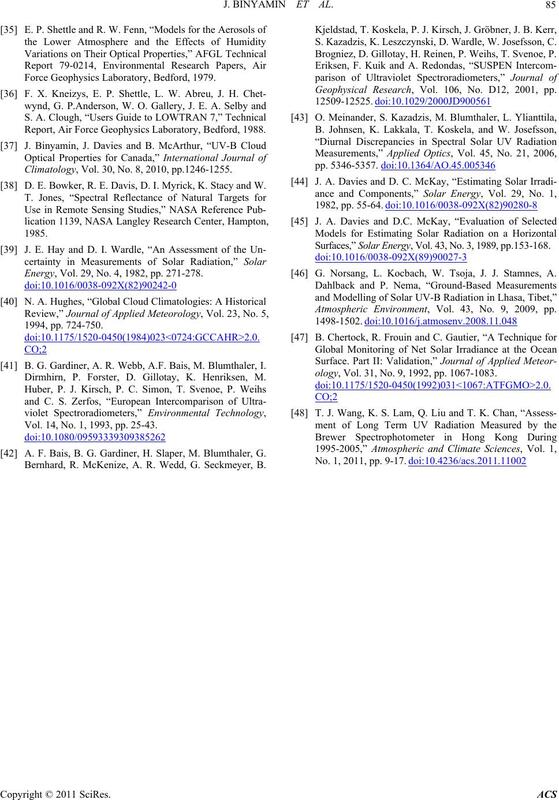 833-836.
troradiometers,” Environmental Technology, Vol. 17, No. 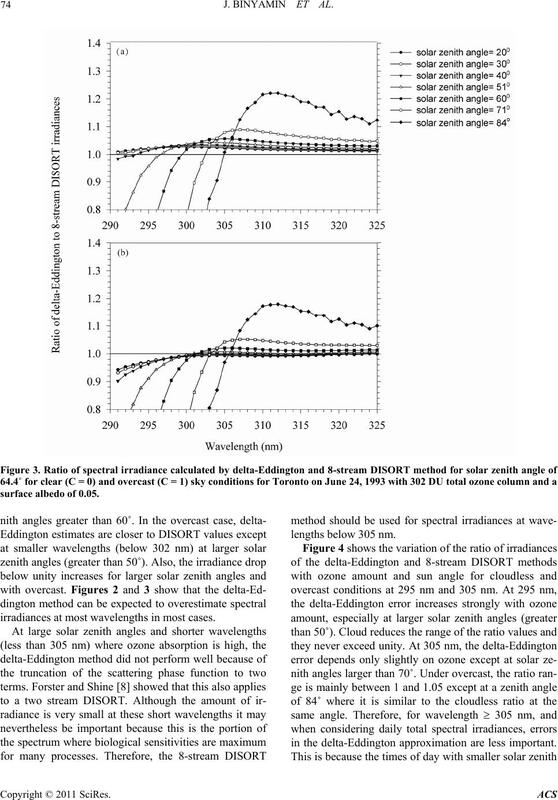 A. F. Bais, S. Kazadzis, D. Balis, C. S. Zerefos and M.
UV Irradiance,” Solar Energy, Vol. 60, No. 6, 1997, pp. 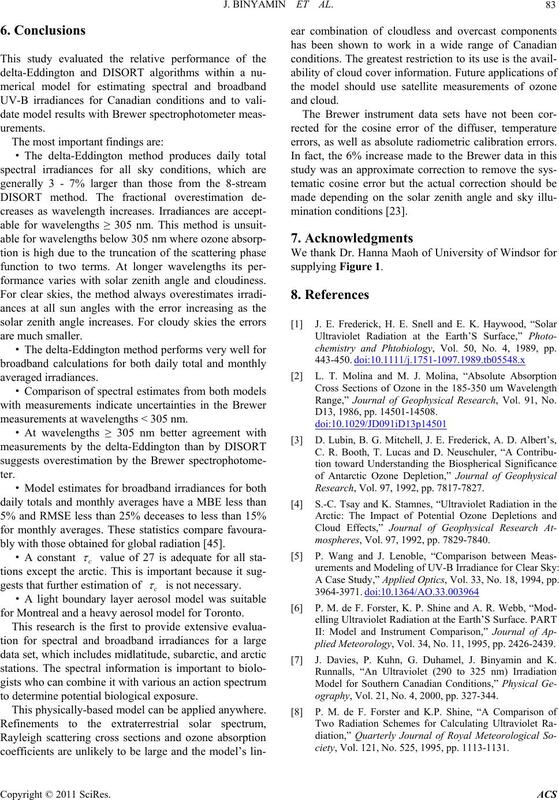 J. R. Herman, N. Krotkov, E. Celarier, D. Larko and G.
ances,” Journal of Geophysical Research, Vol. 104, No. search, Vol. 105, No. D4, 2000, pp. 5037-5048. Vol. 105, No. D4, 1999, pp. 4829-4831. Irradiance in the Presence of Tropospheric Aerosols: 1. 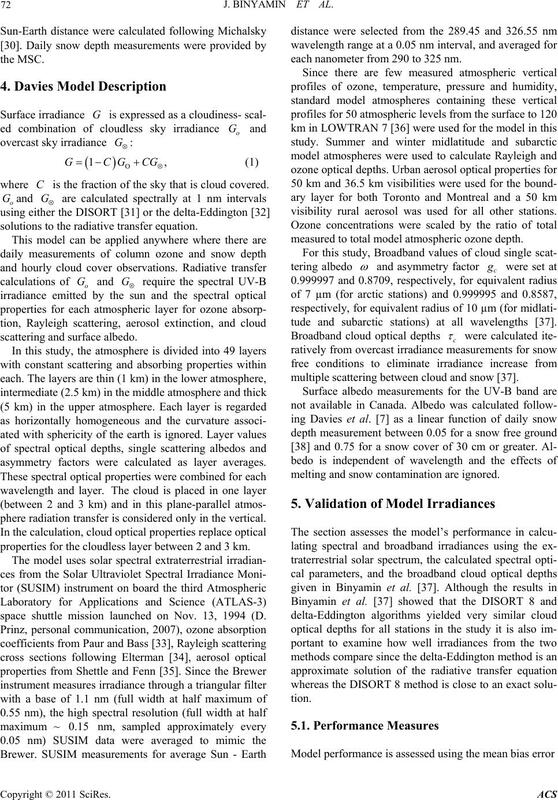 Cloud-Free Case,” Journal of Geophysical Research, Vol. 103, No. D8, 1998, pp. 8779-8793.
lar Energy, Vol. 40, No. 3, 1988, pp. 227-235. No. 12, 1976, pp. 2452-2459. Reidel Publishing, Dordrecht, 1985, pp. 606-616. Force Geophysics Laboratory, Bedford, 1979. Report, Air Force Geophysics Laboratory, Bedford, 1988. Climatology, Vol. 30, No. 8, 2010, pp.1246-1255. D. E. Bowker, R. E. Davis, D. I. Myrick, K. Stacy and W.
Energy, Vol. 29, No. 4, 1982, pp. 271-278. B. G. Gardiner, A. R. Webb, A.F. Bais, M. Blumthaler, I.
Dirmhirn, P. Forster, D. Gillotay, K. Henriksen, M.
Vol. 14, No. 1, 1993, pp. 25-43. A. F. Bais, B. G. Gardiner, H. Slaper, M. Blumthaler, G.
Bernhard, R. McKenize, A. R. Wedd, G. Seckmeyer, B.
S. Kazadzis, K. Leszczynski, D. Wardle, W. Josefsson, C.
Brogniez, D. Gillotay, H. Reinen, P. Weihs, T. Svenoe, P.
Geophysical Research, Vol. 106, No. D12, 2001, pp. Surfaces,” Solar Energy, Vol. 43, No. 3, 1989, pp.153-168. G. Norsang, L. Kocbach, W. Tsoja, J. J. Stamnes, A.
Atmospheric Environment, Vol. 43, No. 9, 2009, pp. ology, Vol. 31, No. 9, 1992, pp. 1067-1083.